Alan Tam Wing Lun, Hacken Lee, Raymond Lam Fung, Leehom Wang, and Twins performed at the Venetian Hotel’s Third Anniversary Concert in Macao over the weekend. 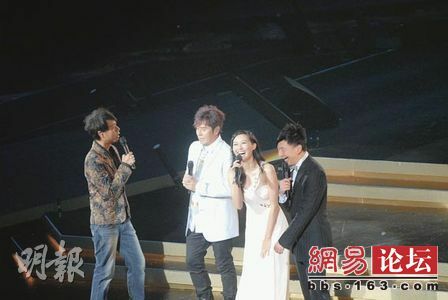 Fala Chen acted as a MC for the concert and became the object of Alan and Hacken’s teasing. Alan said, “To be successful in the music industry, you need to be driven and possess a good figure. At first glance, you’re only mediocre. But that’s unimportant, as you already found a new way through Neway Star Music [referencing Fala’s boyfriend, Sit Sai Hang, whose family owns Neway Entertainment Group]. Hacken asked Fala to sing <夏日之神話> without the accompaniment of music. Aside from laughing awkwardly, Fala did not know how to respond. The preparation for the concert appeared to be inadequate. Hacken almost tripped over some confetti paper on stage. Hacken had to lead Alan Tam away from wrong part of the stage, where the smoke effects were released. During the Twins performance, Gillian Chung’s microphone did not work properly and she had to share the microphone with Charlene Choi. In November, Twins will be holding a concert series in Macau again. After the show, Hacken said that fortunately he was a singer with experience and was able to avoid slipping on the confetti paper while onstage. He laughed and said that Alan indeed forgot his place to stand on stage, since he was focused on “bullying” Fala Chen. Hacken celebrated Alan Tam’s his sixtieth birthday on several occasions this year. Giving a travel luggage set as a gift, Hacken hopes that Alan will be able to travel more and bring happiness to people in different parts of the world. Jayne: Alan Tam turned 60 this year! He sure looks a lot younger; the article made him sound forgetful like an absent-minded old man. Fala Chen is a hot commodity these days; she is even hosting mega-star events such as the Venetian’s concert. Fala is really going to the top fast! The event has big artistes!! Well she’s very pretty and talented so no suprise! Hacken’s words are so full of bones. He’s teasing, but, with a lot of sarcastic hints. Sigh, MC nowadays all follow Eric Tsang’s style. Fala is the like the old Linda now, going very fast. I wonder if it’s too fast for her. Fala has a good voice. I just hope that she can really equip herself with good skill before releasing an album. Enough with karaoke singers. At least Fala can sing better than Linda and she’s nowhere as over promoted as Linda. If it’s her boyfriend’s company the company will surely prepare carefully for her. fala cant sing for her life. Especially with that accent of hers? Shes jst like kate. She still sings better than Linda. ^True. But so does 99% of the population. Nothing can save a horrendous singing voice. Fala is indeed rising very fast. As someone who likes her very much, I hope it’s not too fast. Especially singing, seems like something she has embarked upon prematurely. Not everyone will have the fortune Raymond had, and succeed so well in music industry so fast. And in all honestly, Fala still has very far to go with her acting. I do wish TVB would pair Raymond and Fala up. They had great (sibling) chemistry in MR and they looked cute together in 72 Tenants. Plus, they would make such a great looking couple, LOL. ^ Fala will make a great couple with Ray. I bet it will be better than RayLinda since Fala is prettier and has better acting skills. She’s also much younger and prettier than Charmaine who looks like Ray’s aunt. Many TVB singers gain money by small concerts in US and Canada. I know many young siu sangs and fadans went to sing at Vegas, Toronto, NY, Genting etc after they become singers. Except Tavia, Kenneth Ma who are not singers. Since Fala also become singer she can also have her own show overseas like the others and gain money and experience. Fala can definitely sing better than Linda. I would love to see a Fala+ray and Fala+bosco pairing. She is definitely being promoted heavily. but she is more talented than linda chung. ^No thanks to a Bosco pairing! Watching him in GTL and he grates my nerves. His acting is still so-so. I’d rather see her paired up with Ron or Sammul. I really think Ron has improved – he’s not as heavily promoted anymore, but it seems like he’s really focused on improving his acting instead of going too fast. Sammul has always been talented and I’d like TVB to use him more for “hot” pairings instead of always the dorky ones. Sammul is a good-looking guy too. I’m looking forward to Linda and Ron to see how they do. It’s a fresh pairing. how did linda come into this? the topic is about fala. i think its tvb and the artist manager, that helped fala snatched up this gig as they are going to soon introduce her into the music world w/ some help from her bf’s side soon. just tvb trying to market their artist everywhere these days. fala is climbing faster than all others as she is the most agressive and lack of a better word, “pushy” actress at tvb right now. she doesnt stop until she gets the role, as in Turning Pt, theactor Michael Tse and Director already wanted christine kuo and agreed on it but she intercepted to sell herself as the better candidate in cantonese(she still has an accent so not much better) instead despite already having another drama on hand, that’s greedy in my opinion. No thanks to a Bosco pairing! Watching him in GTL and he grates my nerves. His acting is still so-so. I am growing to like both Fala and Kate. I have to say that although Kate can’t sing, she has great stage presence and can dance. The same goes to her acting which many hated but despite her many flaws Kate is unique and has style as an actress although not a great actress yet. Again, feel free to disagree. I don’t care much about Linda and I like Fala more but it’s a bit overwhelming to see so much comments keep stressing “Fala is the best!! Linda is the worst! !” over and over again. Every artiste has their own unique charm and have different styles, and target different people. Acting is a very subjective thing. I like Fala’s acting over Linda as of now, but I did not deny that Linda has potential too :). Maybe she just haven’t found that acting enlightenment yet. For new people, TVB has always having this practice of promoting a certain people for this year and change the person to be promoted for next year. That was why back then we have Ron being promoted, Myolie being promoted, Tavia promoted last year and this year is Fala’s turn. Next year it might be someone else. 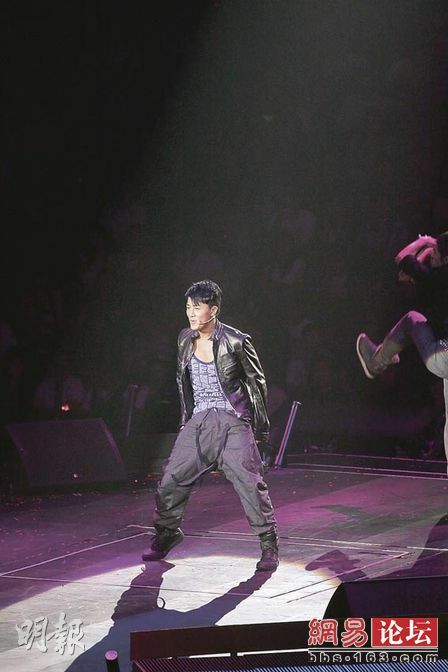 I hope Alan Tam will not fall into the stage hole like Lam did at Lisa Wong’s concert! !